Assay and reagent tracking is a crucial part of the laboratory workflow. With the advent of 2D tube barcoding, assay tracking has been simplified and allows you to track your samples far more easily. K-Trak™ is the next generation of the LGC Cyclops™ - single 2D barcode reader. K-Trak substantially increases throughput by parallel scanning multiple 2D barcode tubes. 3 front facing USB ports allow easy connection of keyboard, mouse and external scanner. The K-Trak 2D barcode scanner is used in our own service laboratories to enable the accurate tracking of assay delivery across sample plates. K-Trak scanner reads 2D barcodes of the assay tubes, before and after the Meridian2 ™ dispenses the assay into the linked plated assay. 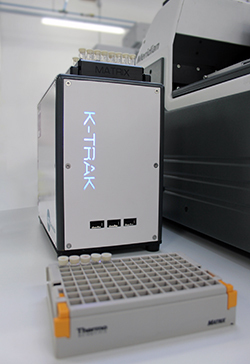 Reduced risk of human error since Kraken tracks assays tubes and links the assay to the plate. Scan multiple tubes in parallel.